The Flathead already has 2,000 miles of roads like this one in Sullivan Creek demoted to Maintenance Level 1 Basic Custodial Care, where they don’t receive the care needed to keep their ditches and culverts from plugging and then washing the roads into your trout streams! (Another 1,400 miles are open to public motor vehicle use and have their own costly maintenance issues). The Flathead is accepting public comments on its draft Travel Analysis Report, which would simply abandon even more old logging roads rather than carefully decommission them to remove culverts and sediment source problems. Click here to visit the Flathead’s Travel Analysis Report web page. Click here to read our comments on the Travel Analysis Report. Click here to read our additional comments on the Travel Analysis Report, made in light of our discovery of slumps in the Sullivan and Quintonkin Creek roads. Click here to read the Hungry Horse News Article about our discovery of the recent Sullivan Creek landslide. Click here to read our press release about the Sullivan Creek landslide. Click here for our letter to state and federal agencies urging that all old logging roads in Sullivan Creek be decommissioned. 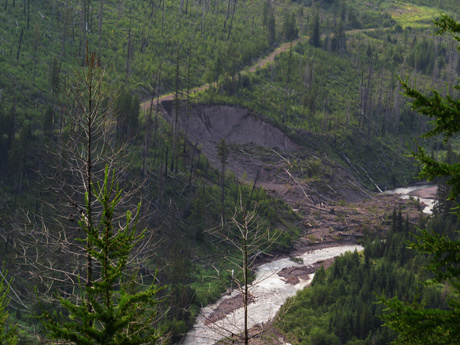 Click here to read the Flathead’s “Assessment of the Sullivan Creek Mass Failure,” which claims it was nature’s fault. Click here to read the Flathead Beacon’s article about the Flathead National Forest still insisting it is an innocent bystander and intends to ignore this road as it continues to collapse, rather than promptly fixing more potential problems further up the road! Click here to see our video of the Sullivan Creek landslide.